[W]ith its wailing, eerie sound, the bone trumpet, or kangling, is intrinsic to the otherworldly atmosphere created by the Chod ritual. Made of a human thigh bone (Tibetan: kang = leg, ling = flute), it is a musical instrument with very special’”and very magical’”qualities. At first glance, one might assume that the kangling was assimilated from Himalayan shamanism or the ancient Bon religion that pre-dated the entry of Buddhism into Tibet. In fact, the thigh bone trumpet was not used by either of these older traditions. The long bones of the human body form a natural club or other utensil, but just as in Western culture, ancient societies did not use human remains casually. In fact, the reverse was true, ancestral bones being considered either sacred objects of reverence, or strictly taboo. Besides, animal bones, sinews and horns were readily available for a variety of practical uses. In actuality, the Chod kangling is part of an ensemble of sacred instruments that emerged from the tantric crucible of India some fifteen hundred years ago. There, both Shaviite and Buddhist yogins and yoginis lived as wandering ascetics, staying close to charnel grounds, wearing bone ornaments, and using a unique group of ritual implements, including the human skullcup. These same objects, worn by the deities described in tantric liturgies, also appeared in the great monasteries of the time, used for both their profound symbolic meaning, and as objects possessing inherent spiritual power. Buddhist tantric religion and lifestyle’”the Vajrayana’”began arriving in Tibet around 800 A.D, and the kangling appeared in these Himalayan regions some time over the next century. However, it is only with Machik and the development of Chod that we see the emergence of the thigh bone as an important and widespread ritual instrument, essential for the brilliant new form of spiritual practice that would sweep across the fertile valleys and desolate mountain ranges of Tibet. 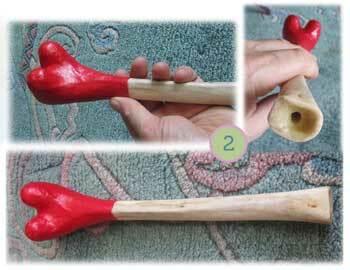 The Chod kangling is a simple length of femoral bone, from the knee joint to about half way up the thigh. Thus, the size of the trumpet varies according to the stature of the former owner, being approximately 12 inches in overall length and 3’ inches in diameter along the shaft. A hollow path is created by removal of the marrow, and holes are made in the two sides of the knee protuberances (epicondyles). These are also hollowed out to create two bells, creating a kind of double-headed trumpet. The blowing end is usually scalloped or beveled inward slightly to form a conical mouth piece. This makes an effective horn, capable of surprisingly loud and piercing sounds. In order to keep the interior dry and free of microorganisms, beeswax is poured through the kangling, and a hot metal rod used to clear a central path. This creates a moisture barrier, as well as making the sound more resonant and clear. Fresh bones were readily available in old Tibet where, as still occurs today, the corpse was dismembered and feed to the vultures during traditional sky burials. Now, as then, such rites are often presided over by chopas, using rituals that transform this final offering of the body into a sacred act. Various texts and oral traditions describe the best source of the Chod kangling, which is the vehicle of our offerings. Accordingly, the most perfect specimen would be from a Brahmin child, male or female, free from worldly stains or faults. At the other end of the spectrum, it should not be from someone who died of tuberculosis, plague or other contagion, or some accident or misfortune1. The right leg of someone who died in their youth, with clear mind, is considered a Daka kangling’”possessing enlightened male energy. The left leg from a similar individual (male or female) is a Dakini kangling, possessing enlightened feminine energy. Other traditions say that a female bone should be from the left side, and a male bone from the right leg. Further, a Daka kangling can be defined as coming from someone killed by a knife or other weapon, while a Dakini kangling is from a woman who was a tantric consort. According to the Mindroling manual of sacred instruments, the left leg of a young male who died by a knife has subtle qualities, while the right femur of a woman in her prime who died similarly is of also of fine quality. Another ideal bone for Chod comes from a monk or nun with unbroken vows. One can also understand that a kangling made from a great saint or enlightened sage would have very unique powers and generate realization in the user, for reasons described further on. Such important relics would naturally be passed down to appropriate heirs or lineage holders. If one uses the bone of a parent or relative, this accumulates significant merit or positive karma for the deceased in their future lives, though such a specimen would be hard to come by in the modern context. Other Chod traditions describes a kangling from a young mother who has died in childbirth, but whose child lived as being extremely auspicious; The energy of the such a bone would be suffused with thoughts of deep, one-pointed love and sacrifice for the child. Others maintain that, regardless of all the above considerations, whether for anatomical or spiritual reasons, a female bone produces a clearer sound. Without all these special characteristics, in general the femur should at least come from a person age 16-60, originating in a “pure” cemetery. Of course, today it is quite rare to know the origin or history of the kangling and its former owner. Some traditions mention kanglings made of tiger bone, and others vulture bone, as being highly auspicious, but elsewhere this is frowned upon. An all-metal, copper or brass form of the trumpet, also simply called a kangling, are used in a variety of tantric rituals, such as those of the wrathful Yidams and Protectors, to invoke or announce the fierce and powerful presence of the Deity. Like the Chod kangling, their use is confined to musical punctuation and accent, rather than accompaniment. Their sound, however, is higher-pitched and far more intense and piercing. But this kind of copper trumpet is never used in Chod. There are also ‘hybrid’ thigh bones whose large end is covered with ornate metalwork, of silver or ‘white metal’ (an aluminum alloy). Again, these are part of wrathful practices for dispelling or removing obstacles. Such hybrids are not appropriate to Chod, all the more so because the metal head often hides damaged or absent knee epicondyles. Lastly, there is a tradition of using kanglings made of wood (which might be a more easily available choice today). Traditionally, it also quite acceptable to make a “horn” of one’s hand, as blowing through the curled fingers and imitating the sound of the kangling does indeed carry the signature of our life force, as described below. MaChik particularly cautions against using a trumpet made from animal horn of any kind’”the kind used by shamans and wandering folk healers’”as having many negative side-effects for the user. 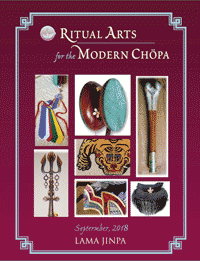 However, the Mindroling manual mentions that the tradition of using antelope or deer horns in the Chod ritual has been widespread among certain schools and teachers. Further, it is said to engender compassion in hunters and fishermen, and increase the number and longevity of the wildlife, fish and fauna in the area. In recent times, ina kangling made of resin (i.e. plastic) have appeared in Asia and the West. For the reasons which will become clear below, such a horn would have no value for the practice of Chod, until such time as the human energy channels are made of plastic and we intend to summon plastic, bone is better choice! 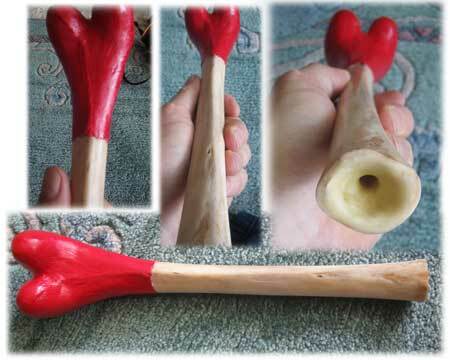 If you are interested in a genuine human thighbone trumpet or kangling for use in Chod or other sacred rituals, beware! Most that you will find (and they are not easy to find!) are from robbed graves of Muslims or from Chinese political prisoners. This is horrid fact of life. Indeed, the grave-robbing is the exact reason why not even medical skeleton specimens can be gotten from India. That whole macabre industry was shut down by the Indian authorities years ago. Currently it is also illegal to transport human bone out of Nepal. One does so at the risk of huge fines (in the thousands of dollars) and possibly more serious legal complications, depending on your ability to bribe your way out of the situation.